Reclining on the West Bank of the Nile River in Giza, Egypt, lies a mythical creature of epic proportions with the muscled body of a fierce lion and the proud head of a man: The Great Sphinx of Giza. 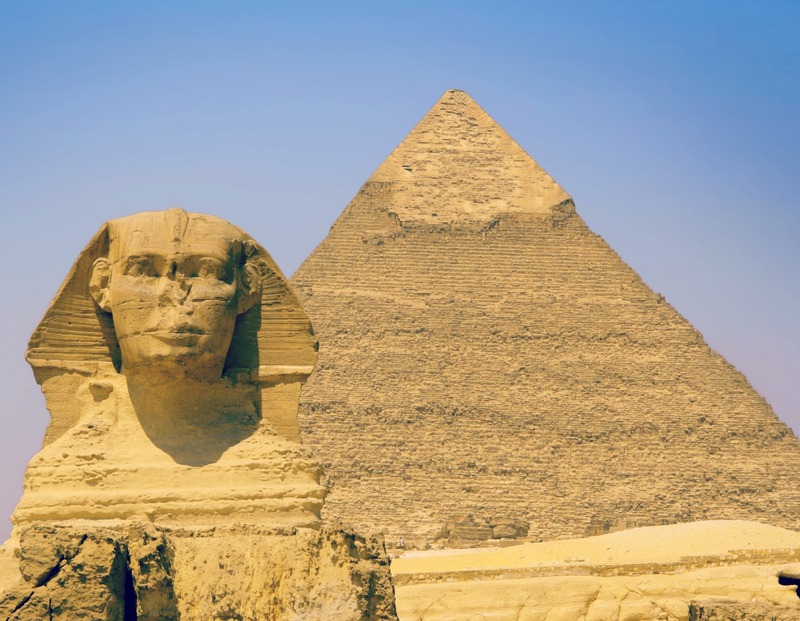 Archeologists and historians debate the specifics of who, what, when, and why, but most agree the Great Sphinx of Giza is the oldest (built around 2500 BC) and largest monolithic statue (that means it’s one single piece of rock) in the world. It measures 241 feet (73.5 meters) long, 63 feet (19.3 meters) wide, and 66 feet (20.22 meters) high. That’s enormous and let’s just say this guy has some serious paws. They’re each around 50 feet (40 meters) long. All carved right out of the limestone bedrock of the Giza Plateau. The face is believed to be a likeness of Pharaoh Khafra, a 4th Dynasty King of Egypt. The beast is thought to be a guardian of the tomb of Kahfre warding off evil spirits. The Sphinx symbolizes strength and wisdom and has become synonymous with an Egyptian style of royal portraiture, as well as a symbol of Ancient Egypt. We think he’s a pretty cool mascot.